Take Two is an American 60 minute scripted crime television series, which kicked off on June 21, 2018, on ABC and is broadcast every Thursday at 22:00. The show is currently in its 1st season. 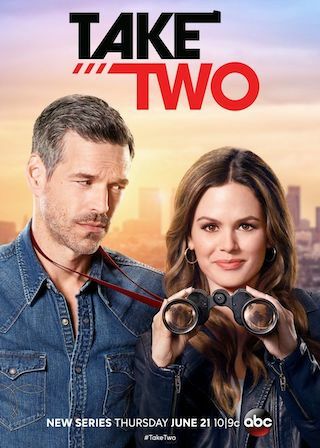 ABC opted not to pick up Take Two for Season 2. Take Two officially canceled on ABC. Sign up to track down your favorite TV shows. Sam Swift, the former star of a hit cop series, is fresh out of-rehab following a bender of epic proportion. Desperate to restart her career, she talks her way into shadowing rough-and-tumble private investigator Eddie as research for a potential comeback role. Though lone wolf Eddie resents the babysitting gig, high-spirited Sam proves herself to be surprisingly valuable, drawing on her acting skills and 200 episodes of playing a detective. When the press touts Sam's role in solving a high-profile case, Eddie finds his phone ringing off the hook with new clients looking to hire the pair.